Just one block from the famous Khao Sarn Road. 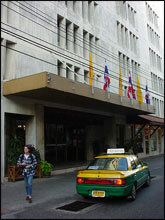 The Viengtai takes pride to be one of a few hotels located within the inner city of old Bangkok. This area is conserved for historical purposes known as  Rattanakosin Island  We proudly offer 200 newly renovated nice and comfortable rooms equipped with modern facilities at reasonable prices, including breakfast. You will see more of charm of old Bangkok while relaxing at our hotel. 200 newly renovated nice and comfortable rooms equipped with modern facilities, cable T.V., minibar, at reasonable prices,- including breakfast. Guests can see more of the charm of old Bangkok while relaxing at our hotel. Available rooms for your choice- either suite, triple, double, twin or single-bed.